When the data backs up our marketing assumptions, it is always something we like to share. A couple eMarketer graphs came out this month from a study done by digital marketing agency Web Liquid. Amongst the findings we saw more support of photos reigning supreme when it comes to Facebook engagement. Video followed close behind, then text, and last on the list was links. If you have ever posted a link to that latest blog post or sales page and saw the Like count sit at zero, you already knew this. Now go find a photo of that latest ugly Christmas sweater party your company had and yes, comment gold. 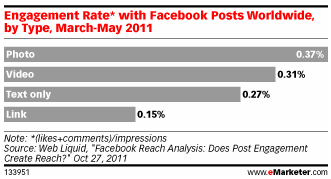 Another graph from the eMarketer report backed up another piece of common Facebook advice, which is to ask for Likes and comments. I first remember hearing this recommendation and some research behind it from HubSpot. So it is nice to hear that the data is still dead on. Asking for Likes does increase engagement, significantly it seems. It is an action word and we see this work in a lot of marketing. Asking for comments does not seem to give that significant of a bump, however. Perhaps it is asking too much? Of course these are very simple tactics. And they do not a Facebook page strategy make. Always test for yourself. Plenty of brands get strong engagement on Facebook with simple, well penned text updates, like Coca-cola. Find your sweet spot with these best practices in mind.